Greg Ralich (seated), Joshua Resnikoff, and Aaron Panone chose Fringe — one of the grittier spaces — for their company, Cuppow. Aaron Panone is a young mechanical engineer who likes being his own boss. So he followed the path of so many twenty- and thirtysomethings with entrepreneurial streaks and launched a startup business in a shared workspace where overhead costs are spread among a collection of small companies. But Panone didn’t set up shop at the Cambridge Innovation Center — the godfather of local coworking spaces — which houses more than 300 startups. He also passed on Workbar, Dogpatch Labs, and other popular options. 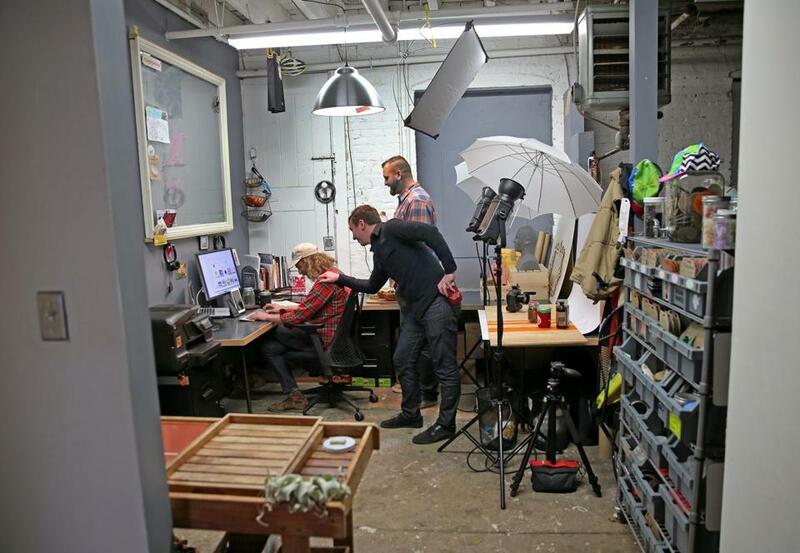 Instead, he chose a place called Fringe in a pair of old brick factory buildings on a side street in Somerville’s Union Square, where a blend of artists, hipsters, and technology professionals make camp. 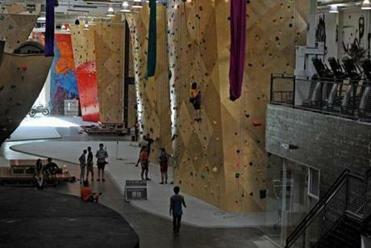 Coworking space has caught on in a big way in Greater Boston, though not everyone needs rock climbing nearby, such as at Brooklyn Boulders. Once the domain of software startups, the coworking model has become so prevalent in Greater Boston that businesses of almost any kind — early-stage or well established — can pick from a diverse menu of shared spaces and probably find one that matches their needs and preferences. They range in style, from underground to posh, and in size, from very small to space for hundreds. Some offer temporary workspace, while others require multiyear commitments. They might charge a simple rental fee, take an equity stake in tenant companies, or even offer seed money. Want a place where you can show up in sweats and pump some iron on your coffee break? Join Brooklyn Boulders in Somerville, which opened in July and features desk space on top of a 22-foot-high indoor rock wall. You don’t have to climb the wall to get there, but people using the standing desks are expected to perform five pull-ups every half hour. Timothy Rowe heads Cambridge Innovation Center, one of the first players. Maybe a prestigious Back Bay address with a receptionist and a spacious private office is important for attracting an upscale clientele. SnapSuites, open on Boylston Street since September and filling up fast, could be the right fit. Or perhaps you belong in a hardhat and goggles, in which case Bolt, in Downtown Crossing, is a possible match. It was launched in July with more than $1 million of manufacturing equipment for gadget makers producing anything from robots to prosthetics. How tailored can these coworking spaces get? The craft beer maker Aeronaut Brewery, which recently moved into a building attached to Brooklyn Boulders, plans to open a startup space called Coolship Labs in 2015 that will be dedicated exclusively to businesses making products through fermentation. The SnapSuites idea of a high-end coworking space — where even the cubicles have handsome wood accents and monthly rents can exceed $3,000 per person — might seem counterintuitive. Companies at SnapSuites share more than half the space, including conference rooms, a kitchen, lounge, and roof deck. Wouldn’t a business that can afford to pay such a premium want an office of its own? 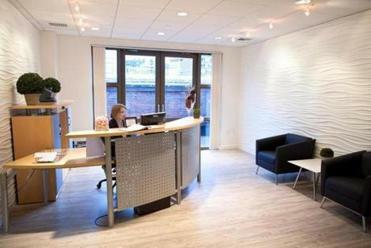 SnapSuites offers high-end Back Bay space. It’s natural that software entrepreneurs formed the early core of the coworking crowd when the Cambridge Innovation Center opened in 1999. Many were recent college graduates, accustomed to living and working in shared spaces on their former campuses. Often, they couldn’t afford offices of their own and gravitated toward opportunities to split costs with others. From a practical standpoint, the people behind software ventures just don’t need a lot of room. Making a mobile app, or running a website, requires little more than chairs for the coders and a table for their laptops. Increasingly, however, other types of businesses are attracted to shared workspaces because they are conducive to peer learning. With a collection of entrepreneurs working nearby, odds are good that one company’s current problem has been solved by a neighbor in the past. Trading advice and experiences helps businesses avoid pitfalls. Drawn in by professional and social benefits, companies like Cuppow are choosing to stay in coworking settings, even when their shared spaces can’t keep up with business growth. Initially, Panone and his cofounder, Josh Resnikoff, packed and shipped their drinking lids from Fringe. As demand escalated and it became impossible to fill orders there, they outsourced those tasks to other parts of the state and hired an operations manager to oversee the supply chain from Somerville. But they never considered moving to another facility. can be reached at callum.borchers@globe.com.